Very Local Radio (in four movements) is an Internet radio broadcast and live performance. This project explores ephemeral communities brought together through radio broadcasts and employs sound to navigate cities. Via journeying, listening and broadcasting, Very Local Radio foregrounds unpredictable performances with places encountered. The project looks like a portable Internet radio transmitter assembled in a shopping trolley pushed by the artists. Audiences access the work as an Internet radio station and tune into the unpredictable sound of movements through places. 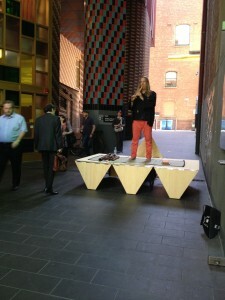 During the Performing Mobilities program, four passages of movement were undertaken amongst the spaces between the RMIT Gallery and Margaret Lawrence Gallery, taking place at midday and midnight, sunrise and sunset. 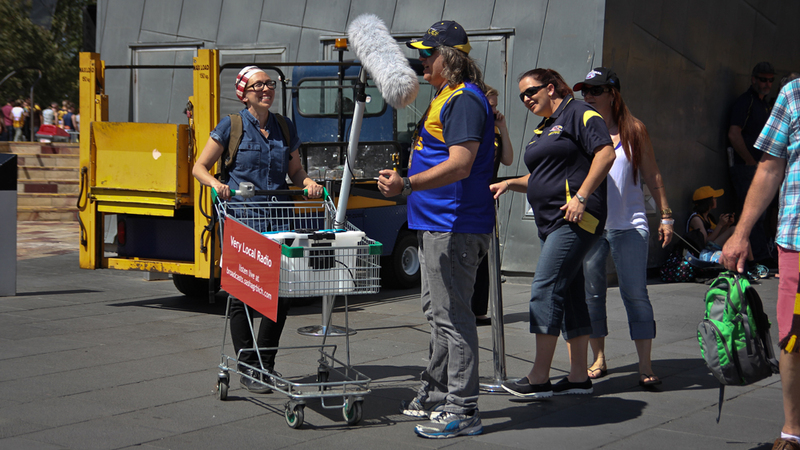 Whilst moving, interesting urban sound ecologies were actively sought out, whilst the trolley broadcaster was used as a tool to explore, meet, and sometimes hand over the microphone to the community. Shared as a live sound broadcast, and generated by navigating on foot, the station was live only during the movements, and each broadcast lasted 1-2 hours. 1 A. Kanngieser, ‘A proposition toward a materialist politics of atmospheric listening’, paper presented to Royal Geographical Society – Institute of British Geographers Annual Conference, 28-30 August 2013, pp. 1–4, http://anjakanngieser.com/a-materialist-politics-of-listening, accessed 20 May 2016. Very Local Radio, 2015. Photography: Zihan Loo. Very Local Radio for PlaceLab, Noarlunga, 2015. At midday, I tune in to Very Local Radio, a live performance and/as live Internet radio stream that uses portable broadcasting technologies to highlight interactions of sound, place and space in realising an ephemeral community. Internet radio is the only way to hear the broadcast, though the live performance can be witnessed. 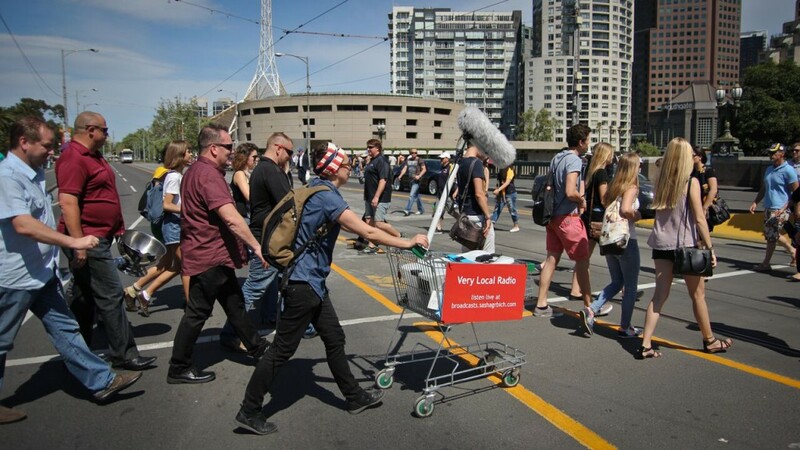 If you spot a shopping trolley laden with broadcast equipment and a boom microphone being pushed through Melbourne’s city centre – across four trips, back and forth, along St Kilda Road and Swanston Street – you are likely witnessing the live event. But without your headphones connecting you to that online stream, you cannot know what is being broadcast. Midday is the first trip, passage, or episode. There’s a text box on the website inviting the listening audience to identify and comment on what it hears. Birds. Trams, we comment. Pedestrian crossings. Horses and carriages. Our comments reveal our presence as audience. Our comments reveal and generate connection, demonstrating personal connections to public locations and interpersonal connections through mutually familiar spaces (the aural geographies being broadcast and the shared space of the website). That man, playing the Chinese string instrument, someone types. He’s always outside the National Gallery. I know exactly where I am listening. Of course, these connections are occurring across space – connections that are simultaneously disconnections. The distance between us as listeners, and our distance from the locations we hear, often feels bridged by the radio stream. 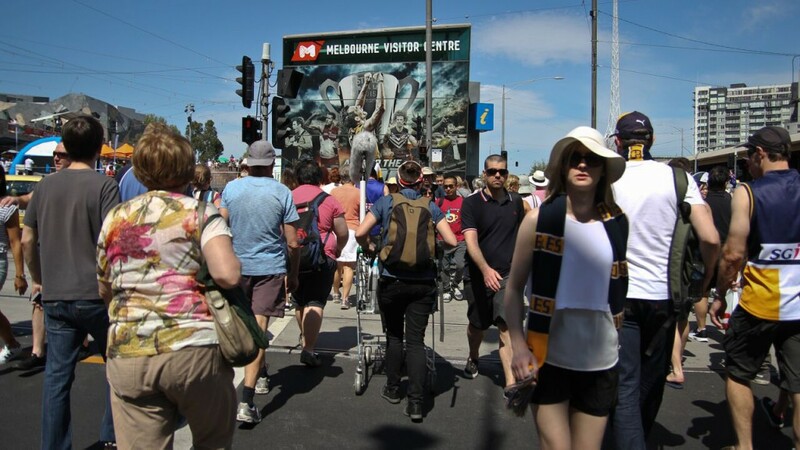 But, at the same time, the broadcast highlights our distance and difference from the streetscape we hear, a difference that hinges on our position as audience and consumers. So who’s listening? asks someone on the street, but my ‘I am’ does not reach them. Alongside unmistakable locations, I hear the unmistakable and unavoidable rattle of the shopping trolley used to transport the broadcast equipment through the city. The trolley is a key feature, highlighting the intersections of sounds, space and place as a way of acoustic knowing.1 The radio audience experiences the trolley – its physicality and mobility – in its sound. Rendered as sound, the trolley is experienced blurrily as material, immaterial, ephemeral and substantial – a fluid materiality. The broadcast enacts an aural duplication and dissemination of object and place across space, a transformation that also transmutes trolley, place and space into consumable broadcast content. Yet, unrecorded and non-downloadable, the place-as-sound content continues to resist form and definition. We also hear the trolley’s impacts on and in the places it broadcasts to us. Even when the trolley pauses silent, deliberately hovering over a moment, the broadcast activity and technology is revealed and responded to by the public. Let’s give it up for the boom mic, a busker invites his applauding audience, this relationship asking: who is in whose world? I hear the microphone moving through space. The music of buskers regularly fades in, lingers, and fades out – accidental music tracks interspersed in the broadcast, activated by, rather than curated for, the microphone’s presence. I hear the passage of a bustling world through the shifting boundaries of the microphone’s sphere, the technology’s reach, the broadcast’s documentation and projection.